This online slot game is Novomatic’s best kept secret! It’s visually stunning, entertaining to play and, most importantly, very generous! After all, we all play slots for one reason and one reason only, and that’s to have some lucrative fun! Journey into the middle of the jungle where exotic animals and riches await you. The jungle explorer himself will be there to guide you deep into the heart of the jungle where you’ll find the Temple of Secrets! Can you keep a secret? Not only does this slot pay out when you spin winning combinations of matching symbols, but it also has a ‘free games’ feature as well as a massive progressive jackpot! The best thing about this is that it doesn’t have to be a secret! The more people you tell and the more you play, the bigger the jackpot will get! This 5-reel, 40-payline slot’s riches are hidden and waiting for you! Players who enjoy other Novomatic games, such as: Jungle Explorer, Pharaoh’s Tomb & Rumble in the Jungle will really fall in love with this game. Deep in the heart of the jungle what can you find? Gems, golden statues, animals and temples, of course! Oh, and don’t forget your jungle guide, the explorer! You can check the paytable to see all of the symbols and how much they’ll pay out according to your current bet, which you can alter whenever you like by using the plus and minus symbols at the bottom of your screen. Not all of the symbols pay out the same as some are more valuable than others. From the lowest-paying to the highest-paying symbol there are: the card values from 9 through to Ace; the golden statue; the sparkling emerald; the leopard and the monkey; the temple; the jungle explorer and the golden scroll. All of the symbols will pay out if you spin three or more identical symbols on a payline, from the leftmost reel on neighbouring reels, except the animals which pay from two or more. The jungle explorer is one of the most valuable symbols on the reels and he’s harbouring a secret: he’s the Wild symbol! That’s right: the jungle explorer can substitute for all of the other symbols on the reels, except the Scatter symbol. The Scatter symbol in this game is also secretive as it’s the golden scroll! It’s not only the highest-paying symbol on the reels but it pays wherever it lands and it can trigger free games! The 10 free games will start with a x2 multiplier which means all of your wins will be doubled. You can also win more free games and increase your multiplier by spinning another three or more golden scroll scatter symbols and the multiplier can go all the way up to a whopping x10! The jackpot amount will be displayed at the top-right of your screen throughout the game and you can win this by spinning all 5 reels full of the jungle explorer symbol. What’s amazing is that during the free games, this jackpot will be multiplied by as much as any other win is in the free games, which means that you could multiply it by up to 10! 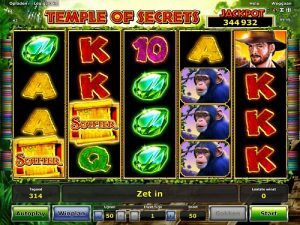 It’s not a secret that many slot games by Novomatic share some classic features, such as autoplay and gamble, and Temple of Secrets is no exception! Every time you get a payout in this slot you can choose to gamble it if you think the odds are in your favour. You can double it and double it and double it again, as long as you keep moving up a step in the game. If you miss, though, you’ll head back to reels without your win. The only time you can’t gamble your wins is if you’re playing in autoplay mode, which spins the reels robotically. This means you don’t have to click to win, in fact, you don’t have to do anything except sit back and relax!